Native American cultural resource monitors survey the jobsite during the construction of a pipeline project in South Dakota. Tribal partnerships to put indigenous monitors on pipeline sites is a win-win, as it employs tribal members and allows them to have eyes on the ground to recognize potential discoveries that are invisible to non-tribal members. The Teamsters union is partnering with Native American communities to provide life-long career pathways in the pipeline industry. Building and maintaining America’s more than 2.5 million miles of pipelines requires a diverse army of professionals. From welders, heavy equipment operators, truck drivers, contractors and laborers, to a vast array of supporting trades and logistics professionals, it takes a specialized workforce to keep the pipeline industry moving. Unfortunately, the pipeline industry faces a skilled trades shortage impacting projects across the continent. In April, the Washington Post described “an unprecedented skilled labor shortage” caused by retiring industry veterans and a generation of high school graduates disinterested in blue-collar work. As the Post explained, high schools nationwide are emphasizing college-placement and STEM courses. They often exclude vocational training toward skilled trade professions. The resulting shortage strains multiple industries that rely on these professionals to stabilize labor supply, and keep costs at a manageable level, especially in the pipeline industry. The Manpower Group, an international staffing agency, told the Post that skilled trade jobs are the hardest of all to fill. It did. And now, 2018 brings a fully-fledged skilled trade shortage hampering regional-scale pipeline projects. Shortages of welders, heavy equipment operators, truck drivers, contractors and laborers are especially concerning for the pipeline industry. Each are critical professions for multiple markets beyond pipelines, from home-building and general contracting to more specialized, project-specific markets. The shortage poses a two-sided problem: workforce development and recruitment. Starting backwards, pipeline companies need to recruit skilled workers and deploy them to projects. But before pipelines can recruit workers, those professionals need training with specific skill sets and must build experience readying them for deployment. With fewer and fewer high schools providing critical trade skills development, only two sectors can provide this vital service: unions and for-profit trade schools. Private trade schools typically put students in the difficult position of taking on debt, posing a major drawback. That’s where unions can play an invaluable role. Unions give free, high-quality training, apprenticeship opportunities and job placement as a part of membership — a turnkey workforce development solution. Unions also provide a recruitment solution, dispatching workers from a ready book of active, trained, deployable workers. Unions also provide life-long career pathways, not just a job. But unions face the same workforce challenges as all the other skilled trade recruiters. While traditional high schools lag in guiding young people toward trade careers, there is another group that could fill the void. Native American tribes have tremendous potential to fill this need while addressing important labor challenges of their own. While unions cultivate tribal partnerships to meet key labor needs, they may also help address larger challenges throughout Indian Country. 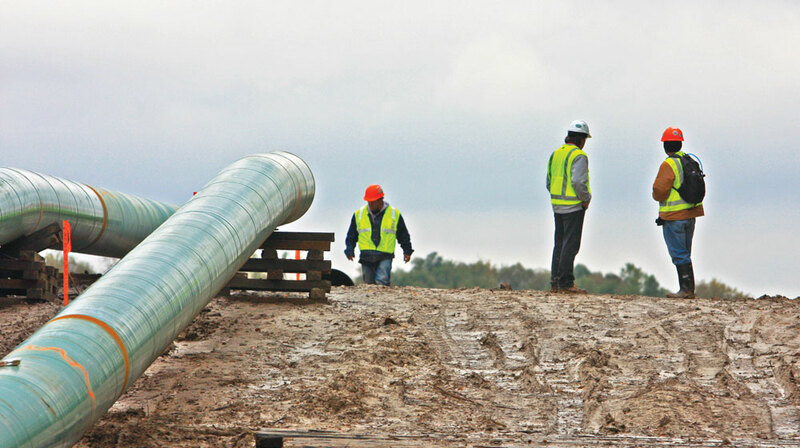 Employing Native Americans as cultural resource monitors on pipeline jobsites is one opportunity for the pipeine industry to partner with tribal communities. Pictured here (from left): Tony Provost, tribal monitor, Omaha Tribe; Lou Thompson, CEO, Tribal Energy Resource; and David Williams, tribal monitor, Kickapoo Tribe. Reservation unemployment is a critical need. Historian and law professor Robert Miller is a citizen of the Eastern Shawnee Tribe of Oklahoma. His book, Reservation Capitalism: Economic Development in Indian Country, explores this problem. Since 2000, he explains, reservation unemployment averages trended from 20 to 80 percent on specific reservations, with national averages hovering near 50 percent. But it’s not all bad news. In an era of rising skilled trade demand, union membership aimed at pipeline construction is one great solution. Unions are a much more attractive option for tribal governments focused on workforce development because unions offer permanent career-paths, debt-free training and high wages. The Cherokee Nation is a prime candidate for a workforce development partnership. The largest American Indian tribe, the Cherokee Nation owns 35 companies producing more than $1 billion in annual revenue and $114 million in profits. It’s no surprise that when Pipeliners Union Local 798 wanted a workforce development project with a major tribe, business manager Danny Hendrix struck-up a conversation with the Cherokee Nation. A sovereign government representing over 360,000 citizens, Cherokee Nation Businesses (CNB) are champions of workforce development. They employ 11,000 in all but one state. Within its home state of Oklahoma, CNB supports nearly 18,000 jobs, putting more than $2 billion into the State’s economy. CNB reinvests 63 percent of its net income back into Cherokee business for workforce development — from training to job growth. Major sectors of CNB operate in three markets directly tied to the pipeline industry: logistics and distribution; federal contracting, and manufacturing and engineering. For all these reasons, Cherokee Nation is a first-rate case-study candidate for a Union-Tribal workforce development partnership. After positive discussions, Cherokee Nation’s Career Services department teamed-up with the Pipeliners Local Union 798 to train Cherokee citizens as welders, journeymen and welder helpers. This culminated in an April 21 signing ceremony for a memorandum of understanding (MOU). Under the agreement, the Cherokee Nation will refer promising Cherokee workers to the Local 798 for training and job placement across the United States. 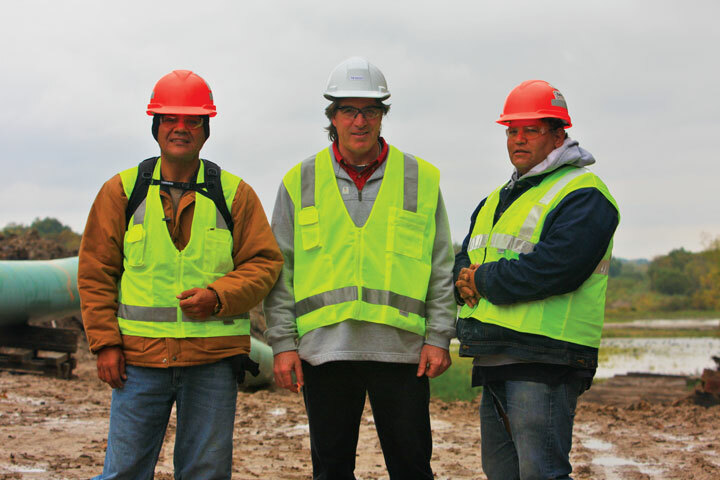 The union in turn provides Cherokee Nation citizens free, specialized training for natural gas and oil pipeline construction careers. Adding to the value of this training, Local 798 specializes in downhill welding, which accounts for the vast majority of work involved with their contracts. The MOU compliments a broad training platform provided by Cherokee Nation Career Services. These include numerous vocational, educational, and employment programs as well as curriculum for youth, skills assessments and certifications, and many other resources for both individuals and businesses. Many of today’s workforce development initiatives highlight the number of jobs connected to a proposed construction project. The Cherokee Nation-Local 798 partnership is doing much more: providing high wage, long-term career pathways with all the benefits of union membership in a high-demand profession. Local Union 798 has about 6,500 members, many of whom are members of federally recognized tribes. It connects qualified Cherokee Nation helpers and welders to projects in over 40 states across the country. Entry level helpers have the potential to earn more than $100,000 per year, while some experienced welders belonging to Local 798 earn well above that, not including their benefits. Helpers connected to jobs through Local 798 complete 5,000 hours of field work before applying for the union’s welder training, getting paid for their time along the way. Because of high demand, the union offers these 14-week training courses three times per year. Lou Thompson is CEO of Tribal Energy Resource, a consulting firm that specializes in Native American relations in the energy sector.